This intelligent adapter makes it possible to simultaneously operate your Samsung Note 2/3 & S2/S3/S4 phone in USB host mode and to charge it at the same time, a functionality not supported by standard USB host mode (USB OTG mode) adapters. With a Samsung USB Charger applied to the PL002, the phone is placed in SimulCharge mode and any attached USB accessory draws power from the external supply. In this state the phone is being charged by the external supply. With no power applied to the PL-002, the module simply acts as a Micro USB-B to USB-A OTG Host adapter. Any USB accessory plugged into the phone draws power from the phone battery. 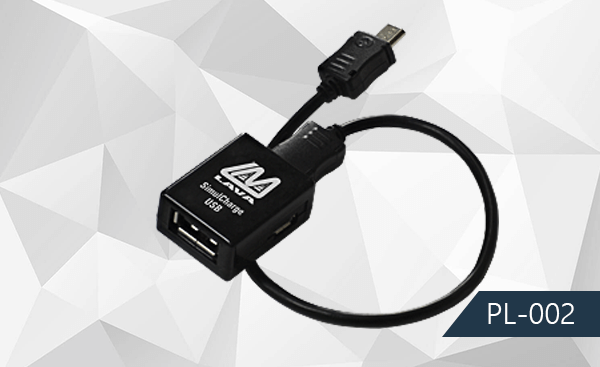 This adapter is designed for robust operation, with more advanced Accessory Charging Adapter (ACA) mode switching. USB DCP (Dedicated Charging Port) Power Supply [REQUIRED] Note: The power supply provided with the supported phones will work. or other devices that operate with USB host mode support. These videos, shown with the SimulCharge TL-002, also illustrate the functionality of the SimulCharge PL-002 for phones.